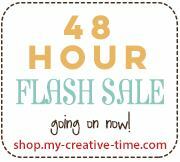 Good morning and welcome to another My Creative Time 48 Hour Flash Sale! This sale is for 48 hours ONLY, going on right now, and it will end on Sunday, October 7, 2018, at 7 AM PST. Don't forget to use the code FLASH at checkout to get 20% off of your entire in-stock only purchase! Sale applies to in-stock items only! Start shopping here.